It’s that time of year when thoughts turn to love and Valentine’s Day is just around the corner. 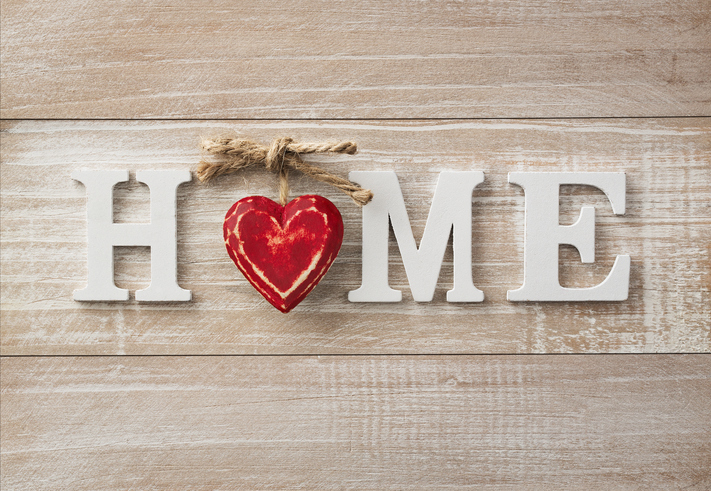 Have you considered that your home needs love, too? A home that is cared for and appreciated will give back to you tenfold. Take advantage of this time of the year to show your home some love in the following ways and just watch how it lights up your life! 1. Flowers: We’re not talking about the kind you plant outdoors though that kind is wonderful and keeps on giving. Why not pick up an inexpensive bouquet or potted plant at the grocery store or flower shop and place in the middle of your living room. It will surely brighten up not just your home but your spirits as well. 2. Bathrooms: With a brand new shower curtain it’s an easy, quick, and inexpensive way to rejuvenate your bathroom as well as the whole experience of bathing. 3. Countertops: A normal scrubbing will make your countertops look good, but a bit of extra care will make them look great. Whether laminate, granite, marble or stainless steel, there are great products on the market to maintain the countertop material in your kitchen at a higher level. 4. Cabinetry: If your stained or painted wood cabinets have seen better days, give them a facelift. A fresh coat of paint or a different color will affect the look of your kitchen in a positive way. 5. Artwork: Art can transform a room in an instant. Choose artwork that appeals to your taste, complements your existing décor and speaks to you on some level. 6. Furnaces: It’s easy to keep buying replaceable fiberglass furnace filters, but if you really want to treat your HVAC system well, consider stepping up to a model that improves air quality and energy efficiency. 7. Closets: While it may take some serious effort, putting your closets in order will not only make you feel better, but will also make your life easier. Take it over the top with a fresh coast of bright white paint. You’ll be glad you did every time you open the door. 8. Carpeting: Hire a professional to steam clean your carpeting. While a carpet may look clean enough, a thorough conditioning not only removes dirt, but also redistributes the pile, making the carpet appear new again. 9. Walls: Whether you’re painting an entire room or just one wall, a fresh coat of paint is always a super idea. For the price of a can of paint, it’s one of the easiest home improvement projects you can tackle that will have a big impact. 10. Entry: Take the time to decorate the entrance to your home so that when you arrive home it gives you a pleasant feeling and relaxes you. It doesn’t take much to decorate with something simple and nice to look at.